RALEIGH, N.C. -- Daniel and Henrik Sedin have been inseparable since birth. 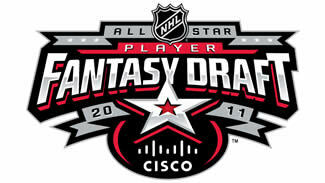 Or at least they were until Friday, when the red-headed, identical twins were selected opposite one another during the NHL All-Star Fantasy Draft powered by Cisco at the Raleigh Convention Center. Daniel, the goal-scorer of the two, was picked fifth overall by Team Staal. Henrik, the assist man, was plucked with the very next selection by Team Lidstrom. It will mark the first time in their careers they will face each other on the ice. "I haven't really thought about playing against him yet, but it's an All-Star Game and it's exciting," Henrik said. "We actually expected not to be playing together from the day we got picked to this All-Star Game so it's no surprise for us." While it was the second time Daniel was taken before Henrik in a draft-type setting -- the Sedins were selected second (Daniel) and third (Henrik) overall by the Vancouver Canucks in the 1999 Entry Draft -- Henrik still considers to have one up on his brother. "I was born first, so I actually won the race," he quipped. Daniel, meanwhile, is out to prove that he's the better of the two twins. "I think it'll be fun; but we're used to playing with each other so I'm sure it'll be different," he said. "We had a lot of fun talking about it before the game, but it's more for the media and the fans. The talk back home (in Sweden) was the same as it was here. Everyone is excited that it's the All-Star Game. There's a lot of talk about it, but it's just a lot of fun being here together." Henrik was actually a little nervous while waiting to hear his named called. "I think there was a little nervousness … it was a little more nerve-racking then I thought," Henrik said. "It was actually uncomfortable. It's still a draft, you know, so you want to get picked as high as possible." Lidstrom was hoping to see the Sedin twins play on opposite sides. "I wanted to see them play against each other more than with each other," Lidstrom said. "I figured (assistant captain Ryan) Kesler was going to pick one of them. He was going after both, really, but (Team Staal) didn't want that to happen. It wasn't stressful making a decision, I enjoyed it. You really couldn't go wrong with any of the picks." The Sedins were born in Ornskoldsvik, the same town that produced Peter Forsberg and Markus Naslund, and started playing hockey together at the age of 8. They have that ability to know where the other is on the ice, it seems, at all times. The question now is whether that telekinetic ability will work to their individual advantages on Sunday when the NHL All-Star Game presented by Discover takes center stage. "I don't know; I guess we'll see," Daniel Sedin said. "I think 5-10 minutes into the game, both sides are going to play to win that game." Through 50 games this season, Daniel leads the Canucks with 64 points, including 27 goals. Henrik is second on the team with 61 points, including 50 assists. Daniel has 235 goals and 611 points in 755 career games in Vancouver and Henrik has 484 assists and 633 points in 778 career games.